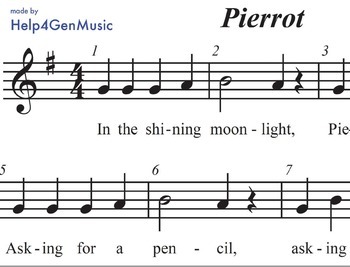 Here is a FREE download of the printed music for the classic French folksong Pierrot, a popluar B-A-G only recorder song, which your students will love to practice and perform with Help4GenMusic's Recorder Karaoke track for Pierrot available here on our store on TpT. Note there is an excerpt you can listen to via the brief 'video' demo above - look at the thumbnails under the main picture for this product. Check out all of our tracks and songs available for recorders! Super fun and affordable. This is in a jpg format sao you can insert it into any app like Word, Smart Notebook, or Power Point for display or printing for your students. It is made to nicely fill a screen/Smartboard as is!